Associated Press reports that the police have blocked off a 38-square-kilometer (almost 15-square-mile) “no-protest zone” encompassing the airport where leaders will arrive and the conference center where they will meet. They have also also denied Erdoğan permission to hold a rally on the sidelines of the summit, which could have drawn huge protests from Kurds living in Germany. Demonstrations are required to register with authorities otherwise they’re considered illegal and can be immediately broken up. That means that police can be expected to react swiftly to any “spontaneous” protests inside the security zone closer to where the world leaders are meeting. The 20,000 police and counter-terrorism force from Germany and Austria are ready for mass arrests and have converted a wholesale supermarket into a prison for 400 people. Hamburg is bracing itself for an escalation of violence on the eve of Friday and Saturday’s G20 summit, after local people complained that heavy-handed police have ratcheted up tensions in Germany’s second largest city. Authorities in Germany’s second-largest city are preparing for the arrival of an unprecedented lineup of controversial world leaders including Donald Trump, Vladimir Putin and Recep Tayyip Erdoğan, as well as thousands of international protesters ranging from anti-capitalist activists to middle-class families keen to voice dissent. Police say they expect a core of about 5,000 violent protesters to gather in the city’s historic port area for a “Welcome to Hell” march just as world leaders and international delegates start arriving at Hamburg airport on Thursday afternoon. The Hamburg police chief, Ralf Martin Meyer, expressed concerns that the city would see “not just sit-in protests but massive assaults”, as anarchists from Scandinavia, Switzerland and Italy joined up with local activists in a city with a long tradition of leftwing protest and annual May Day riots. In the run-up to the summit, German police have seized knives, baseball bats and containers presumed to be filled with flammable liquid and unknown chemicals from various locations in and around Hamburg. Jan Hieber, a senior officer, said police had probably only found a small proportion of the weapons that had been stockpiled for use in the protests. “There is evidence that the acts of violence around the G20 summit that we had expected and feared will take place,” said Meyer. The interior minister, Thomas de Maizière, announced on Tuesday that 15,000 police would be on duty at the summit. A note by the German defence ministry leaked to Der Spiegel advises soldiers against wearing their uniforms in public during the summit for fear of becoming targeted by “spontaneous attacks by members of violent-prone participants of leftwing extremist protests”. The leaked document also mentions plans to “disrupt the summit’s procedure, occupy all access routes and logistics hubs, attack urban infrastructure and blockade the harbour”. Many local residents complain, however, that heavy-handed policing against peaceful protesters has helped ratchet up tensions in the run-up the G20 meeting on 7 and 8 July. 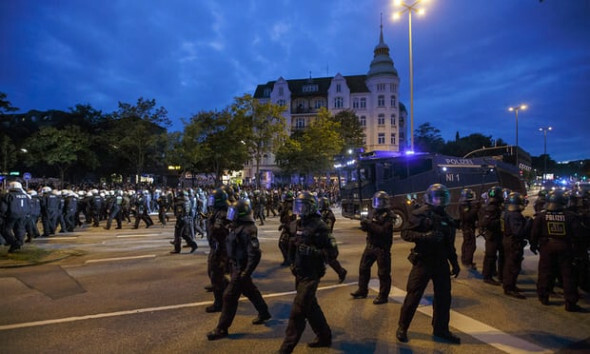 At 11pm on Tuesday, Hamburg police used a new fleet of “WaWe10” water cannons to clear an area between the Schanzenviertel district and FC St Pauli’s football stadium, where hundreds had gathered to drink alcohol and listen to music. “Cornering”, supposedly inspired by breakdance crews hanging out on street corners in 1980s New York, has been purposefully adopted as a form of “hedonistic protest” by Hamburg activists in recent weeks. Similar forms of protests, including a public rave in the harbour on Wednesday evening, are planned throughout the summit. The German newspaper Taz described Tuesday’s show of strength in the midst of a peaceful protest as a “professional escalation” on behalf of the police, which would have caused howls of outrage had similar incidents taken place in Russia or Turkey. Hamburg’s police union had warned that it would not pursue a strategy of deescalation unless activists scaled down their rhetoric. “A strategy of deescalation can only work when both sides want and allow it,” said Oliver Malchow, of Germany’s police union GdP. “We want that for all 30 registered demonstrations. But in the face of the rhetoric of leftwing activists and names like ‘Welcome to Hell’ we have to presume a high potential for violence. In that case deescalation would be inappropriate,” he said. The German chancellor, Angela Merkel, has appealed to protesters to express their dissent in a peaceful manner, warning that “those who turn to violence mock democracy”. In an interview with weekly Die Zeit, Merkel defended the controversial decision to hold the G20 summit in Hamburg, arguing that the scale of the event and the expected number of visitors had required the infrastructure of a large city. Merkel, who will meet Trump for a 45-minute bilateral meeting on Thursday night followed by a joint dinner with Asian delegates, said getting world leaders around the same table for a conversation was “a value in itself” at a time when changing power structures were causing “speechlessness”. One thing in the US perspective that gives the discussion of this event a surreal quality is seen in the phrase: “protesters ranging from anti-capitalist activists to middle-class families keen to voice dissent.” Anti-capitalist protesters and “middle class families” are two opposing factions. The middle class itself is dependent on the capitalist state. Without capitalism, there would be no middle class, and the class war that has defined the US for the past 20+ years, middle class vs. poor, would not exist. And, of course, middle class families will not be participating. No sane people would allow children, a core part of families, to get caught up in such protests. Further, this is an international event, not American. Middle class elitism is a distinctly American ideology.